It is a world within a world. In this 4-square-mile patch of Orange County you’ll find more Vietnamese shops, overhear more Vietnamese conversations and find more Vietnamese menus than anywhere in America. It is a place to buy live snails, catfish heads, banana buds, fish sauce, jackfruit, salted duck eggs, baby lotus roots and 50-pound bags of jasmine rice. 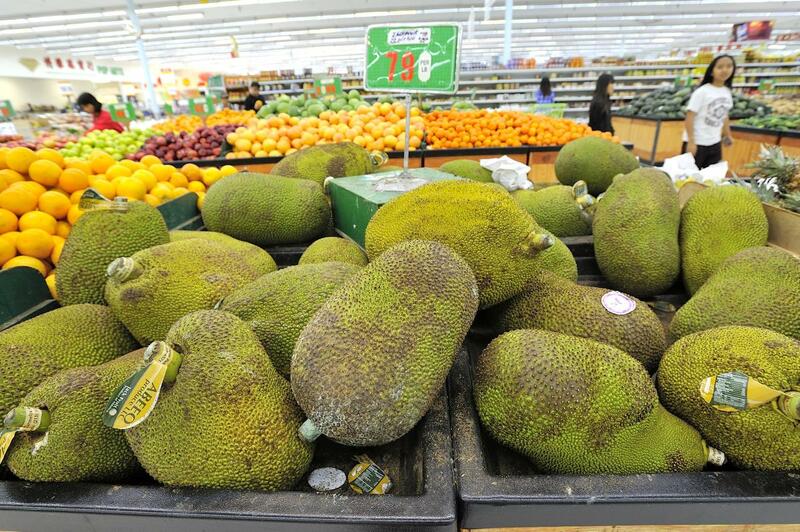 Jackfruit are on display at Westminster Superstore. Older women still wear traditionalnón lá or conical leaf hats. Older men sit in cafes reading about their homeland or playing Tien Len, a traditional card game. South Vietnamese flags flutter from lamposts. This is Little Saigon – hub of the world’s largest enclave of Vietnamese outside of Vietnam. It began soon after the fall of Saigon in 1975, when the first wave of Vietnamese refugees arrived in Southern California. In 1978, a fewrefugees opened businesses along Bolsa Avenue in Westminster. The area is now home to more than 3,500 Vietnamese-American businesses – from family-run pho shops to the Asian Garden Mall, which attracts tourists from around the world. Little Saigon sits in the heart of Orange County, five miles from Disneyland, six miles from the Pacific Ocean and within 50 miles of 282,000 Vietnamese-Americans who keep Little Saigon thriving. Other Vietnamese enclaves have sprung up in U.S. cities, including San Jose, Houston and Chicago. Many call themselves Little Saigon, but none is older or larger than Orange County’s Little Saigon, which serves as the hub of the Vietnamese diaspora. It is considered the Vietnamese capital of the United States. 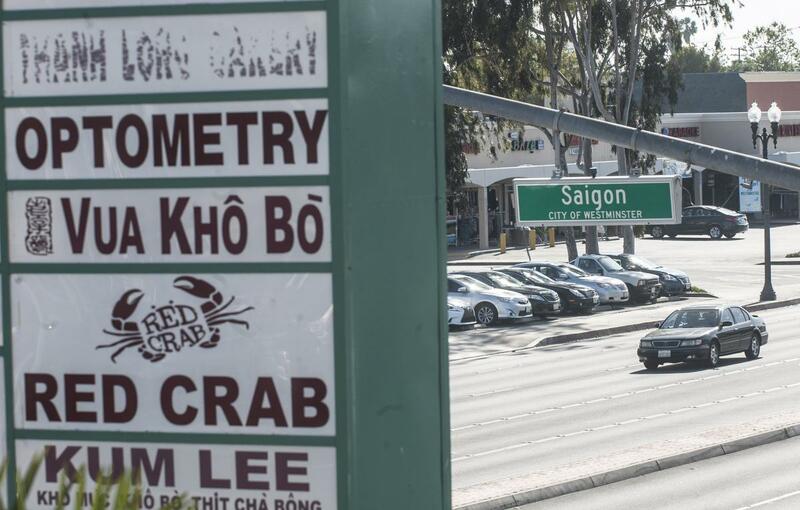 Orange County’s Little Saigon offers Vietnamese-Americans a slice of the original Saigon – with Vietnamese architecture and festivals, Vietnamese doctors and herbal medicines; Vietnamese temples and television stations. Tucked inside Little Saigon’s shopping centers and strip malls are small, family-run bakeries, tea houses and delis. The markets stock dragon fruit, lychees and pickled celery. The cafes and bakeries sell banh mi(Vietnamese style sandwiches) and French-style coffee with condensed milk. The grocers stock live tilapia in fish tanks ready to be taken home and steamed with ginger, scallions and onion. In all, there are more than 200 restaurants, about two dozen TV and radio stations, and three Vietnamese-language daily papers. Little Saigon’s centerpiece is the 150,000-square-foot Asian Garden Mall (Phuc Loc Tho), a hub of Vietnamese-American businesses and cultural activity where kids can buy fresh-squeezed sugarcane juice while adults bargain down prices at the county’s largest gold jewelry mart under one roof. In 2005, Westminster’s growing number of Vietnamese-speaking doctors, lawyers, accountants and other professionals attracted the fastest growing Asian supermarket chain in the United States, Shun Fat Supermarket, which sells imported groceries from China, Taiwan, Japan, Thailand, and Vietnam. Each weekend, Little Saigon’s streets swell with traffic as thousands drive in to meet friends, share meals and catch up on Vietnamese-language news. It is more than a place to shop. Little Saigon is a self-sustaining community – whose reach of shops, restaurants and politics now spill into Garden Grove, Santa Ana, Fountain Valley, and Huntington Beach. Each year, the Asian Garden Mall hosts the annual Flower Festival. The event precedes Tet, a celebration of the Vietnamese Lunar New Year that falls in late January or early February, marked in Little Saigon with alively parade and a festival. A street marker hands in front of Asian Garden Mall marking the heart of Little Saigon. April 30th marks the 40th anniversary of the fall of Saigon. Little Saigon boasts the largest enclave of the first-generation Vietnamese and their descendants outside of Vietnam. A street marker hangs in front of Asian Garden Mall, marking the heart of Little Saigon. Little Saigon has evolved and expanded over the past four decades. In 1978, the business hub was no more than a dozen small shops along Bolsa Avenue in Westminster. In 1988, California Gov. George Deukmejian officially designated “Little Saigon” as a 3-square-mile business district bordered by Westminster Boulevard (north), Bolsa Avenue (south), Magnolia Street (west), and Euclid Street (east). That year, a sign designating a route to Little Saigon was installed on the 22 Freeway in Garden Grove. Today Little Saigon is considered roughly a 4-square mile area bordered by Trask Avenue (north), McFadden Avenue (south), Magnolia Street (west) and Euclid Street (east). Yet even that can’t contain the sprawl. About 5,000 Vietnamese-American businesses operate in Westminster alone, according to the . The Vietnamese-American Chamber of Commerce of Orange County. Some 4,000 operate in Garden Grove. And throughout Orange County, more than 10,000 Vietnamese-American businesses operate. Little Saigon’s footprint now includes parts of Westminster, Garden Grove, Santa Ana, Fountain Valley, Huntington Beach and Anaheim. 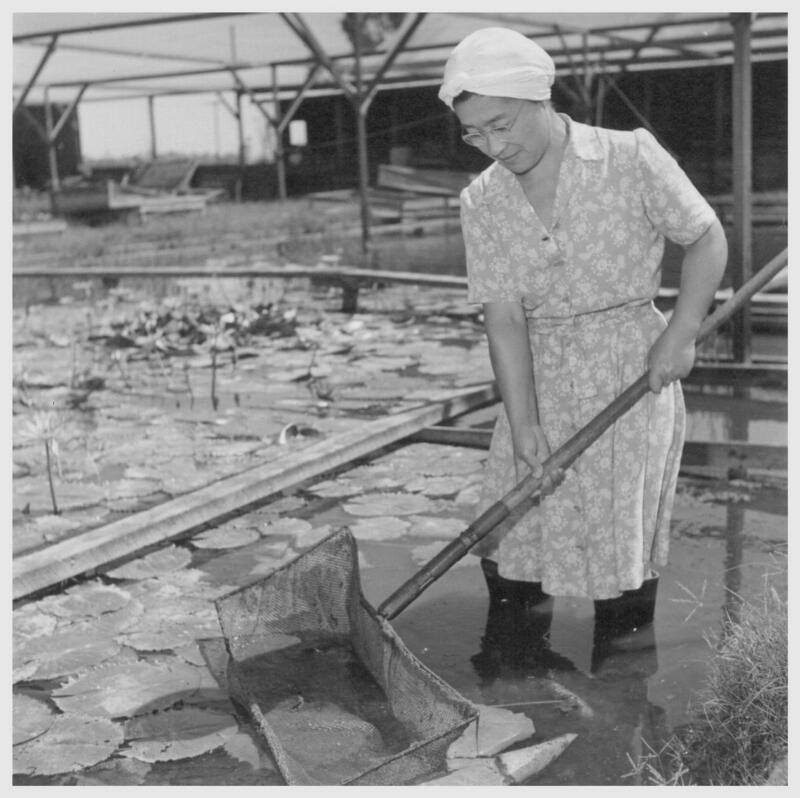 Long before Little Saigon existed, Westminster was known for artesian wells, duck hunting and farming. It was home to the world’s largest goldfish farm (where the Westminster Mall stands today), and the world’s largest airplane (the 1927 Schofield Albatross made by the Zenith Aircraft Corporation at Bolsa Avenue and Moran Street). But Westminster was better known for the sugar beets, soy beans and strawberries that grew in its fertile soil. When the first Vietnamese refugees arrived in 1975, the Warne family’s 1915 barn still stood at the southwest corner of Bolsa Avenue and Bouchard Street (the eventual heart of Little Saigon), and the family still grew lima beans. By then, however, the business climate along Bolsa was bleak. Land was cheap. Business was up for grabs. New arrival refugees from Vietnam with volunteer teacher, Be Thi Nguyen. Nguyen taught these children English children songs and nursery rhymes. The Fall of Saigon, on April 30, 1975, triggered the first great wave of Vietnamese to the United States. As the North Vietnamese Army swept south and captured Saigon (renaming it Ho Chi Minh City), some 147,000 Vietnamese and others fled Southeast Asia. This wave was mostly the professional class – with more education, money and English proficiency than average. 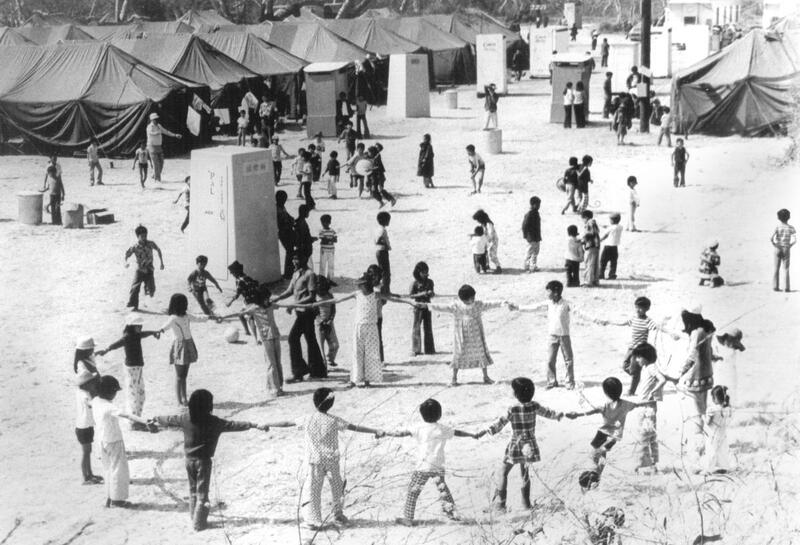 At least 50,000 refugees from Vietnam and neighboring countries landed in Camp Pendleton as part of Operation New Arrivals (April 29-Sept. 16, 1975). Many settled in Southern California. In 1978, a few opened small businesses along the mostly deserted Bolsa Avenue, including Danh’s Pharmacy, Que Huong restaurant and Nguoi Viet Daily News, now the largest Vietnamese-language daily newspaper in the country with a circulation of about 18,000. These early entrepreneurs didn’t know it, but more waves of refugees were soon to arrive. The newcomers would seek the comforts of Vietnamese food, medicine and news – making the early businesses successful, and creating the foundation of Little Saigon. 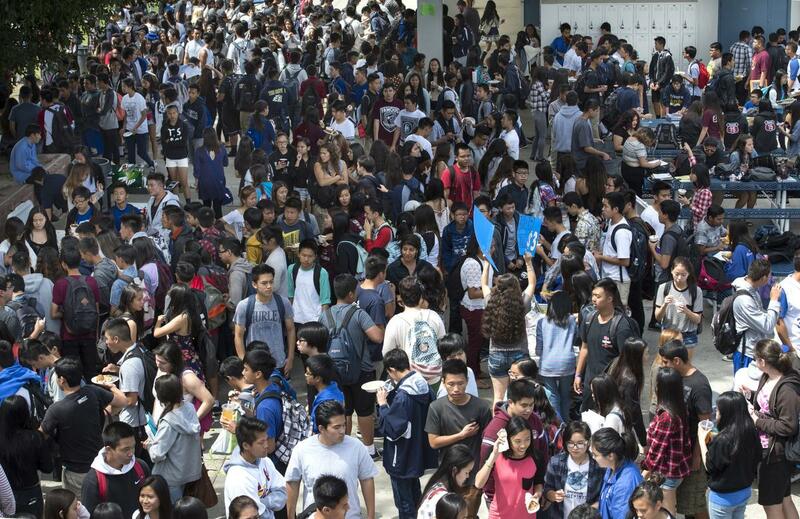 La Quinta high students gather in the quad at lunch break during a Spring Fest event in 2015. Around 75 percent of the students are Vietnamese-American. The second great wave of Vietnamese to America began in 1979 with the arrival of about 44,000 “boat people” – many of them soldiers who had been tortured in Communist re-education camps and later fled by boat with their families. From 1979 to 1990, at least 800,000 refugees arrived in America. These later waves generally were poorer, less educated and less proficient in English than the first wave. Along Bolsa, they could find a taste of home: steaming beef pho, sticky rice, fresh tofu and authentic fish sauce. Here they could get prescriptions written in Vietnamese, buy insurance from a Vietnamese agent, find work in Vietnamese fabric shops. Those who arrived in 1979 found some 30 Vietnamese businesses along Bolsa. By 1981, there were a few hundred. By 1986, there were more than 500 Vietnamese businesses in and around Bolsa. The name Little Saigon wasn’t official yet – that would come in 1988, but already word was spreading. New arrivals weren’t coming just from Vietnam. They were coming from other parts of the United States, those immigrants originally resettled in Arkansas, Pennsylvania, Chicago and New Orleans. Vietnamese around the world heard stories of a new Saigon – smaller than the original, but a place where they could speak their native tongue, eat their native foods and almost feel as if they were home again. It was called Little Saigon. More Vietnamese Americans live in California (608,760) than any other state. More Vietnamese live in the Santa Ana-Long Beach-Los Angeles region (282,319) than any other region in the country. More Vietnamese live Orange County (188, 977) than any U.S. county. And more Vietnamese are concentrated in Westminster (42 percent of the population) than any U.S. city. Within Orange County, Garden Grove (48,436) has more Vietnamese resident than any other city. Vietnamese Americans have become increasingly active in local and state politics. Politicians of Vietnamese origin hold several city council seats in Westminster and Garden Grove, and have been elected as county supervisor and to the California Legislature. –Compiled by Staff writer Tom Berg with Ian Wheeler and Roxana Kopetman.